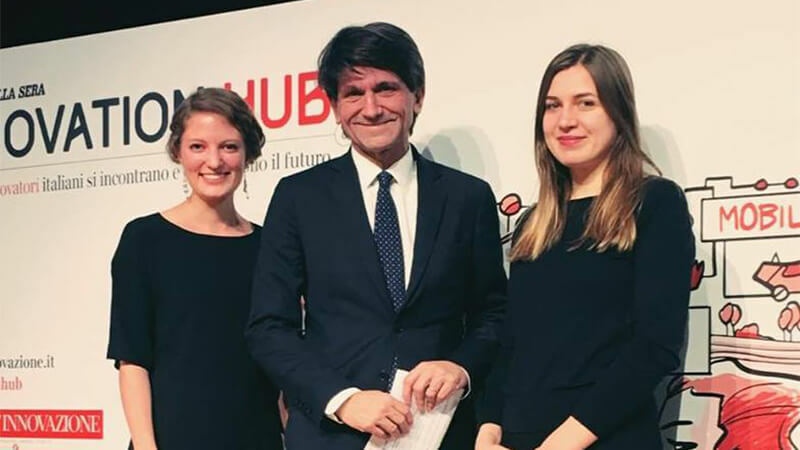 Katharina and Alix with the rector of Bocconi University, Gianmario Verona, at the #InnovationHub initiative. Alix Auzepy and Katharina Bella are currently studying abroad at partner school Bocconi University in Italy. Master of Public Policy students Alix Auzepy and Katharina Bella, as well as their team member Mariama Holman, are among the seven finalists for the B4DPA Bocconi for Digital Public Administration Award, a competition launched by Bocconi University in partnership with the Digital Transformation Team of the City of Milan. Bocconi University is a partner of the Hertie School, offering MPP students the chance to study abroad or earn a dual degree. The objective of the Bocconi for Digital Public Administration Award is to reward innovative solutions for the public sector and contribute to redesigning the Italian public administration of the future. Alix, Katharina and Mariama’s project, M3, which stands for “Make Milan Move”, was chosen among 42 proposals submitted by more than 120 students from over 15 universities worldwide. The finalists were announced in early December during the #InnovationHub initiative, organised by Corriere Innovazione. M3 was inspired by the team’s experiences living in Milan and using multiple modes of transportation in their daily commutes. The project aims to create a new mobility app to integrate the city’s booming number of public and private transportation providers into a single platform. M3 establishes new standards of convenience by offering innovative mobility subscription packages and encourages more shared mobility over private car trips, thus decreasing congestion and CO2 emissions in the city. The team, together with six other finalists, is now moving on to the final round. In February 2018, the winning project will be announced and will receive a monetary prize of 35,000 euros. Good luck in the final round, Alix and Katharina!